I was out today with a group of people from East Herts for Europe in Ware. In among the leafleting and gathering 161 signatures on a petition for referendum on the terms of Brexit (once the government actually works out what those are, and actually manages some meaninful negotiations). There were some fascinating conversations. 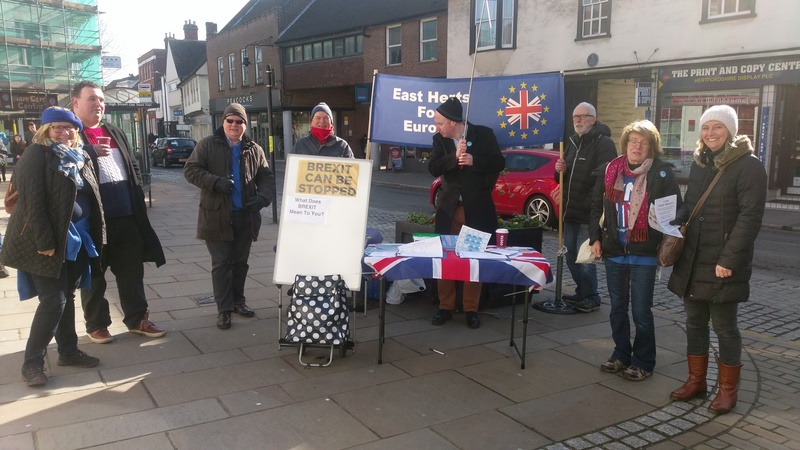 In the referendum campaign, I was focussed on Cambridge, but friends in Hertford and Stortford talk of street stalls getting significant opposition. The case for Europe was worth making and clearly needed to be made. The constituency was the closest in the country to 50:50. Now the feel is different. It’s unwise to draw any conclusions from those who didn’t want to stop and talk, but conversations today were rich. Some shed light on people’s real worries over Brexit, and others on their attachment to it. There were people who stopped to thank us for being visible. There were stories of people feeling gutted by the result and of people from elsewhere in the EU feeling unwelcome since the referendum.